Communicating today's news through biblical lenses, Files From Toni is very grateful for your interest and for visiting this website. We endeavor to put together a variety of topics in the headline news today that line up with prophetic happenings that the Word of God tells us about. Be sure and check the right side bar for more hot topics and popular articles. Thank you for making this site the very successful site it has become. Blessings to all who visit here. 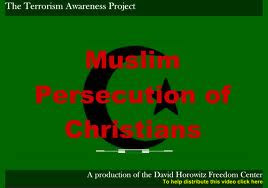 A message from the muslim presidential candidate is being sent to the Christians in Egypt: Bow to Islam, or pay the additional Islamic tax, the jizya. According to the popular Egyptian website, El Bashayer, Muhammad Morsi, the Muslim Brotherhood presidential candidate, just declared that he will "achieve the Islamic conquest (fath) of Egypt for the second time, and make all Christians convert to Islam, or else pay the jizya," the additional Islamic tax, or financial tribute, required of non-Muslims, or financial tribute. In a brief report written by Samuel al-Ashay and published by El Bashayer on May 27, Morsi allegedly made these comments while speaking with a journalist at the headquarters of the Muslim Brotherhood's Freedom and Justice Party, adding "We will not allow Ahmed Shafiq [his contending presidential candidate] or anyone else to impede our second Islamic conquest of Egypt." After his interviewer pointed out that the first Muslim conquest of Egypt was "carried out at the hands of Amr bin al-As [in 641]," he asked Morsi, "Who will the second Islamic conqueror be?" 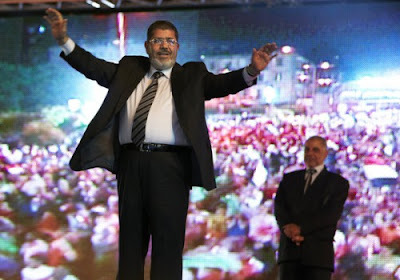 Morsi, replied, "The second Muslim conqueror will be Muhammad Morsi," referring to himself, "and history will record it." When asked what he thought about many Christian Copts coming out to vote for his secular opponent, Ahmed Shafiq, Morsi reportedly said, "They need to know that conquest is coming, and Egypt will be Islamic, and that they must pay jizya or emigrate." More from the Gateway Institute. In the Gospel of Matthew 10:5-23 our Lord Jesus Christ gave specific instructions as he sent out the twelve into the various surrounding cities of the area telling them if the city did not receive them and their words, leave and shake the dust off your feet. It shall be more tolerable for the land of sodom in the day of judgment, than for that city. Flee the city and go into another. For the persecuted Christians of Egypt, the handwriting is in the Book of all Books, the Holy Scriptures. Christians in Egypt must heed the words of Jesus Christ if the Muslim Brotherhood, enemies of the Cross and Jesus Christ, are voted into power in Egypt, and give them nothing. Obviously Christians are not welcome in Egypt. Shake the dust of Egypt off your feet and leave. Have nothing to do with their self destructive and ungodly influences as they will find out soon enough what life will be like under the ungodly influence of Islam. Isaiah 19:1-16. The warnings of Jesus were given to heed and take seriously. For those who are able, now is the time to leave and spread the Gospel message in another area. To those who stay, may the peace and wisdom of the Lord be with you, enabling you to endure. This article strikes a similarity to what the Supreme Court ruled today on Obamacare, saying it is constitutional for the US government to force us to fund a universal "health care", calling it a mandated tax, all Americans must pay into - and as such, once they begin providing unlimited abortions on demand and eventually euthanasia programs as well as forced "medical treatment" to harass and torture everyone "unhealthy" because they smoke, eat fats, eat salts, drink even a touch of wine, etc. and so on - then isn't it going to be us Americans forced to pay a tax if we don't buy the insurance - which in essence will be used to uphold the desires of a US anti-Christ at the top chain of command in this country ordering "free" abortions on demand along with euthanasia mandates and intrusions into personal decisions regarding, eating, drinking, smoking, etc. It might not be forced to pay a tax as punishment for not supporting Islam, but it will be a tax for not supporting an anti-Christ ideology that is pro abortion, pro euthanasia and pro personal choice meddling by the government into peoples' lives - perhaps even compulsory abortions in the future, the kind China requires, once this whole ball of wax gets rolling, now that SCOTUS ruled Obamacare constitutional. So this whole spirit of anti-Christ is already present and in the air, moving itself across the US as well as overseas, taking a different tact in arriving at the same end point, when they meet up in the future and anti-Christ is fully revealed and made plain, the US forced into this belief system also, not just overseas, but here too, through the Obamacare ruling creating its legitimacy. Haven't heard from you in a while. Hope you are doing fine! Hello, Anonymous ... And blessings to you. I am doing fine. And thank you! As the Lord leads, I have been devoting my time to other things that hopefully will bring honor and glory to His name in my community where I live. At some point in time, if it is His Will, I will be back to blogging here, but for now, I have been lead in another direction. 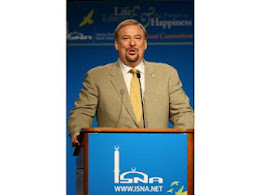 It is uplifting to see so many people come here and read my blog even though I have not put a new entry since June. Thank you so much for your dedicated support here and keep watching for His Return!! It is getting close to election eve and you have not made any comments one way or another about the two main candidates, Obama or Romney. Will you be posting anything this week since it is election week? It's getting late. I believe America is on the downside of destruction. I asked myself, who would Jesus vote for? I was shown the answer. Neither. No human will ever be able to correct the wrongs in America unless the nation has a leader willing to lead the nation to repentence of sin. I don't see that happening. Jesus came to atone for the sins of all mankind. To the Jew first, and then the Greek. Those who do not accept the free gift of salvation by God's grace through faith in Jesus Christ will be eternally lost. Click on picture for more…..
How Much Land Did God Give Israel In The Abraham Land Covenant? Crack In Ocean Floor Or Oil Spill? Ezekiel's War: Who Is Gog? Who Is MaGog? 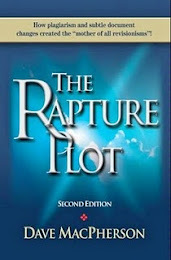 Is The Pre-Tribulation Rapture "Imminent?" Who's Been Bewitching The Pre-Trib Rapture False Teachers?